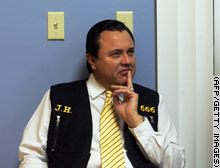 MIAMI, Florida (CNN) -- The minister has the number 666 tattooed on his arm. But Jose Luis de Jesus Miranda is not your typical minister. De Jesus, or "Daddy" as his thousands of followers call him, does not merely pray to God: He says he is God. The church calls itself the "Government of God on Earth" and uses a seal similar to the United States. Although it's a number usually associated with Satan, not the son of God, de Jesus says that 666 and the Antichrist are, like him, misunderstood. The Antichrist is not the devil, de Jesus tells his congregation; he's the being who replaces Jesus on Earth. "Antichrist is the best person in the world," he says. "Antichrist means don't put your eyes on Jesus because Jesus of Nazareth wasn't a Christian. Antichrist means do not put your eyes on Jesus Christ of Nazareth. Put it on Jesus after the cross." So far, de Jesus says that his flock hasn't been scared off by his claims of being the Antichrist. In a show of the sway he holds over the group, 30 members of his congregation Tuesday went to a tattoo parlor to have 666 also permanently etched onto their skin. He may wield influence over them, but his followers say don't expect them to go the way of people who believed in David Koresh and Jim Jones. Just by finding de Jesus, they say, they have achieved their purpose. "If somebody tells us drink some Kool-Aid and we'll go to heaven, that's not true. We are already in heavenly places," follower Martita Roca told CNN after having 666 tattooed onto her ankle. Jose Luis de Jesus Miranda says he is God, and his followers believe him.